This month of January begins the 10th anniversary year of Halfway Home Pet Rescue pet lovers serving Caribou and the surrounding communities with volunteer service to their stray, abandoned, abused, neglected and injured pets. Mainly because of space limitations the HHPR volunteers work with the community felines that are in need of the most help. However, there are many times that we help find a solution for a dog, rabbit, duck, bird, chicken that needs our help. Sometimes it is with food and sometimes it is for emergency medical treatment. This January, we are celebrating 10 years and a total of having helped 2700 on-site animals along with another constant of 300 to 350 animals in low-income private homes, Meals on Wheels, food pantry families, or cats living in feral colonies. How good can it get!!! We started January 2009 with absolutely no funding, but lots of love and commitment to help out where we felt the animals fell through the cracks of the Maine Animal Welfare system. 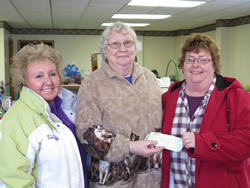 Volunteers worked and used their own money to get a start-up plan for operating. We started with a few cages and a garage and now we have a basic cageless adoption center, feral shed, storage warehouse, thrift store (fundraising) and have also been gifted a HHPR Transport Van by the Emina B. Sewall Foundation as well as much help from the Maine Community Foundation Grants and the Bangor Savings Bank. HHPR became the voice of the helpless and hopeless. We now have over 50 dedicated volunteers helping in many different areas including fostering, transport, direct care, public relations and fundraising (store, returnable bottles and collection jars). Our reward is our satisfaction of seeing multiple “rags to riches” stories that come out of our service. We see frightened, starving cats become plump, healthy, happy owned pets. We see feral kittens turned into tamed and loving lap cats. We see sad children who expected to have to give up their beloved pet due to a temporary family financial crises and we turn those tearful little faces into happy, excited smiles. We cry for the emancipated, dying strays that we can only help by ending their suffering. “We can help.” Whatever the need – HHPR can help. For the latest in what’s happening at HHPR, please visit our Facebook page. This website might be redesigned later this year to simplify the content and make it easier to maintain. What a year! We acquired an industrial building in need of repair and a grant was awarded to make those repairs. The warehouse now gives us storage space for our food distribution program, equipment, and large items for our Thrift Store. We were also granted $33,000 from the Elmina B. Sewell Foundation to purchase a cargo van for our food distribution and cat transport programs. Our Second Chance Thrift Store almost closed for good because the building was foreclosed. The new owner contacted us and assured that we could stay. But better than that – he agreed to let us rent more space! AND renovations on the building are making it a better property overall. We closed for a couple weeks for our own renovations to expand, clean, paint, and arrange merchandise for a very shopper-friendly environment. Thanks to volunteer store manager Gail Gallagher and her crew, we have a nice little store. Volunteer Nichol Soucy was spending a lot of time at our Adoption Center making improvements and gaining an expertise about the cats, so we decided that she deserved the official role as Adoption Center Manager. She has taken this job seriously and she makes sure the cats are happy and the place is a pleasant environment. All our direct care volunteers do a great job on their shifts and Nickie ties it all together. The “AC” has never looked better. We faced some extra challenges when our founder and President, Norma Milton, suffered a broken shoulder and was not able to work for several weeks. Volunteers kept operations going but we did need to make some changes in our ability to take in new cats. Discussion is underway for some other changes to operations in general so that we can continue our mission. It seemed like summer would never arrive – but it did and so did kitten season – all of a sudden. Our little facility was soon over-capacity and fortunately we were rescued once again by our friends downstate. We allowed a few days for our volunteers to catch their breath, clean the facility, and then began going through our intake waiting list to see which animals were most in need of our help. So we were soon filling up cages again. And the kittens kept coming – most were sent down state as soon as they were old enough for the trip, some stayed behind in foster care here. Our volunteers have been great, taking good care of the cats, keeping them healthy and happy. Some volunteers took on extra shifts and tasks to keep things going while other volunteers took some badly needed time off. We are always in need of direct care volunteers! Our Thrift Store continues to do well and the donation collections boxes scattered around area locations are an indispensable contribution to our mission. We have been working with Rick Taggett of Woodland who owns the big barn that collapsed this winter. Volunteers, headed by Norma Milton, have been able to trap 7 of the cats from that colony. The rest have taken refuge in the surrounding woods and makeshift shelters. The captured cats have had medical attention and will be staying in a shed made for ferals until they can be returned to site. One of the cats had an injury to a paw and required the surgical removal of two toes. This might have been lifesaving. We will be doing a story about this project on our Facebook page in the near future. We have had several older and special needs cats brought in to us which has created a burden to our budget, but we always manage to get the bills paid, thanks to our generous supporters. We were very fortunate this winter that we did not have any serious infectious diseases among our population. Volunteers were quick to report any symptoms of concern so that we could segregate those cats. One of our most populated and longstanding barn cat locations suffered a great loss this winter – heavy snow brought down the historic barn on the Rick Taggett property. HHPR has had an estimated 45 feral cats in that colony, many of them for several years. Luckily, no animals or people were injured in the collapse. We promised to work with them in the Spring to make sure their colony gets medical attention and shelter while new buildings are constructed. We continued to be at or over-capacity throughout the Fall and into winter. We assisted a family with the surrender of 12 cats when they could no longer be housed. We made space for them in a foster home and eventually moved them all to a room at our Adoption Center. Several of them were transferred downstate and were quickly adopted. The remaining group are staying with us for further socialization and medical treatment. HHPR President Norma Milton needed to be away for the winter because of family matters so we were essentially closed to the usual number of intakes. We did our best to accommodate the needs of our area. We have had an over-capacity summer! Transports to southern Maine rescues have continued to help us but we have had to close our doors to new intakes. We must keep our cat population to a manageable number – to keep diseases to a minimum and because we simply do not have the volunteer numbers to take care of all these cats. This year we’ve had many seniors and special needs cats come to us. Kitten season came late and continues into the Fall. We had an outbreak of Coccidia, which takes weeks to clear up. All of this has caused higher than normal vet bills. Our food truck program continues to help us offset the cost of feeding the cats in our programs (shelter, feral, barn, foster) but it has not been enough. We have had to buy additional food and litter each month to keep going. We have given away dog food to the Agency on Aging Meal on Wheels program, which we are happy about. On the good news front: HHPR has received 2 grants. One from HSUS for $5,000 and one from MCF Belvedere Foundation for $5900. The one from Belvedere is to be used for pet rescue transport and truck travel expenses. Under more careful management, the Second Chance Thrift Store has raised a new level of income for the vet medical care of HHPR cats. We’re very grateful for these grants. We continue to be closed to new intakes and will remain so until early next year. We are seeking qualified volunteers for our direct care shifts at the Adoption Center and will be stocking up winter shelters for our Community Outreach Program. When we cannot help by taking in a cat, we will do what we can by providing alternate resources. We’ve been working over the past few months and more intensively over the past few weeks in the Van Buren area. Their community cat population is quite large and we’ve heard many reports of abandonment. HHPR Volunteers Dana Kasian and Brian Knox have headed up a TNR project to begin population control. With help from the Cleo Fund, we have spayed/neutered/vaccinated dozens of cats, both abandoned and feral. The ones who can be tamed will be placed for adoption. The ones who are clearly feral will be returned to a feeding site. Our pickup truck has had some problems and looks like it is on its last legs. This truck is used for the monthly food and supplies transport from the Hannaford warehouse in Portland. We’re not sure how we are going to solve this challenge, but we will find a way. This monthly load saves us hundreds of dollars. HHPR relies on these supplies to keep going. Our volunteers have been working overtime to do spring cleaning. But we continue to have a shortage of volunteers and have not been able to have open house hours yet. As the weather gets warmer, we hope to open our doors and invite the public in to see our Adoption Center, meet some of our cats, and maybe even take an adoption or volunteer application home. We were very excited to hear that we won a write-in award of $1000 from the Bangor Savings Bank Foundation’s “Community Matters More” campaign this year. To win this, our supporters had to write in our name on the ballot! We are so happy to know that we have such great support out there. We were also humbled to receive a $450 donation from Heather Miller of Miller’s Safe Haven. Heather and her husband, Jon, care for many disabled and special needs cats and dogs in their Houlton home. We enjoy relationships like this where we can work together to support the mission of animal rescue. Kitten season so far has been fairly quiet and that has allowed us to spend time on other issues that have had to wait. Operating a volunteer-based rescue is no small task and we have been very fortunate. We will soon be able to announce intake number 2000! That’s right – since HHPR began in 2009, we have helped that many cats – and can you imagine the hundreds of unwanted kittens and cats who might have suffered from neglect or abuse without this intervention? Please consider supporting us through monetary donation or whatever way you can. We want to be able to continue operations for many years to come. Spring is here – almost! And the hot topic is KITTENS. We’ve been getting calls for kittens but we have not had many calls from people needing to surrender kittens. The kittens that we have had come in this winter were mostly feral and needed rehabilitation time. By the time they are socialized they are often 5-7 months old and many people don’t want a kitten of that age. These kittens are usually transferred downstate where they find homes right away. We are not receiving many applications to adopt from what we would consider suitable homes – some obstacles to adoption are financial ability to seek medical care, small children who might get scratched by a frightened cat, other pets in the home, age of the cat, or the adopter’s insistence to declaw. Bear in mind that we are a RESCUE not a shelter. Most of the cats who come to us have seen hard times, have suffered neglect or abuse. We invest time, emotion, and money to rehabilitate and therefore we take time to consider the best options for their futures. We have continued through the winter to network with the Animal Refuge League of Greater Portland. They share our mission philosophy and have the resources to care for our cats in a similar manner. The population base in southern Maine and nearby states provides greater opportunity for suitable adoptions. Without their help we would not be able to continue our rescue work in the County. Our cats are healthy and socialized when they are transferred. Social media provides a marketplace for “free pets” where people are giving away kittens that they have found or from an unspayed female in their home. While most of these probably find good homes, there are some who end up abandoned without being spayed or neutered. We try very hard to spread the word that there is funding to help people get this procedure done, but there are still those who do not take advantage of this resource. We have heard complaints that our fee is too high. The adoption fee for a kitten is $75: includes medical treatment of parasites, age-appropriate vaccinations; spay/neuter or assistance for it, and a free checkup with a participating veterinarian. Value = $100-200. Social media has free kittens: seldom have ever seen a vet, no shots, has fleas, worms, no spay/neuter, and no free checkup. Value = ?? Cost = $200 (if you want a healthy cat). The “shortage” of kittens does, however, speak to the success of the funding programs such as SpayMaine.org, the CLEO fund, and Marian’s Dream. Fewer unwanted litters means less suffering. If you seek to adopt a kitten we hope that you consider these points discussed here. Please take your pet to the vet, adopt from a reputable source – do your homework. It’s 2016 already – wow – 2015 was a record-breaking year for HHPR. We helped more than 400 cats and kittens. For a bit of the year in review, check out our HHPR Winter 2015 newsletter. The need for our services has continued to grow and we are doing our best to keep up. We remain an all-volunteer organization and we always need responsible adults to cover direct care shifts at our adoption center. This winter we have worked hard to maintain the quality of care to keep contagious illnesses to a minimum. With the help of our network of other rescues and shelters in Maine, we have been able to transfer adoptable cats where they can find good homes and free up our space. This relationship has been invaluable – without them we would not be able to continue. With this in mind, this website might not always be up to the last minute in detail on what we’re doing and what cats we have available. Our Facebook page is the best place to keep up with us. But even that might not show everything. Here it is July already and we’ve been so busy we’ve not had time to make any News updates here on the site. Most of our “up-to-the-minute” type information can be found on our Facebook page. The year 2015 is now half over and we have already seen 200 cats come through our doors that needed help for one reason or another. Even with financial aid available for spay and neuter, we continue to see and get reports of abandoned cats and litters of kittens. We get calls of people needing to relocate and their landlords won’t allow cats. We would like to be able to help more, but we just don’t have the space, the money, or the people to manage such a task. We often must turn away people because we just do not have one more inch of space and still be able to keep our environment healthy for the cats. We do not want to compromise on the quality of care we provide. We know that overcrowding causes stress and illness. The cage space at HHPR provides each cat with room to stretch and keep the food, water, and bedding away from the litter box. When cats have time to settle down from their initial shock and depression of shelter admission, we allow them time out of their cages to play and explore. When cats demonstrate ability to get along socially with other cats, they are allowed to remain cage free. Fresh air, soft music, and the loving attention of volunteers adds to the environment. HHPR has continued working with feral colonies and hoarding situations in the area. Our barn cat program still needs more participants – barns, stables – does not matter how big or small – taking just 2 feral or semi-socialized cats to work as rodent patrol is a great help. 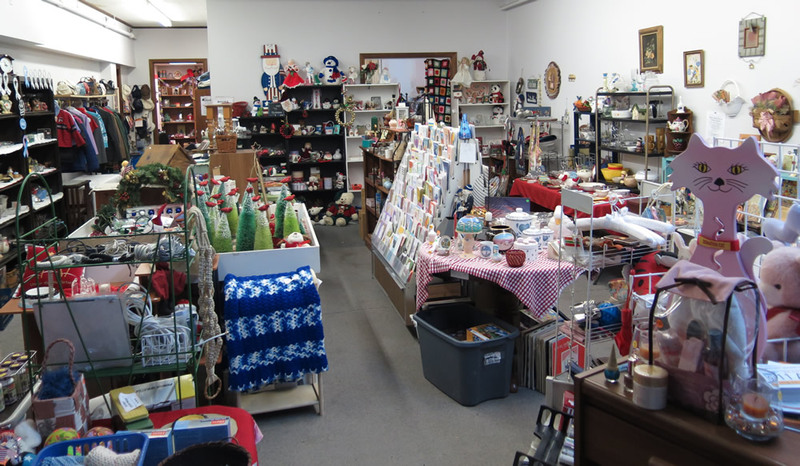 The Second Chance Thrifty Gift Store on Hershel Street in Caribou appreciates your business – please stop in and see what bargains you can find. We have not had the time or resources to even publish our print newsletter! If you have desktop publishing skills and would like to help us with that, please call us at 999-1075. Second Chance Thrift Store – proceeds directly benefit the animals. We’ve got all sorts of merchandise to keep you busy browsing and finding bargains. Located at 31 Herschel Street in Caribou, next to the Presque Isle Animal Hospital Caribou Clinic. Hours are Thursday-Monday 10am to 4pm. We have been full all year. It seems like we’ve had an endless stream of abandoned kittens this year. This just emphasizes the need for SPAY and NEUTER!! Funding is available through the Spay Maine program and special focus is now on Aroostook County through a program called Spay Before 5 for $5 sponsored by Marian’s Dream and Spay Maine. Call 207-809-5116 to find out if you qualify for a voucher. The F.A. Peabody Company is running their annual pet photo contest through their Facebook page. Every “like” is a donation to the shelter named as recipient on the photo. To “vote” for photos, you need to visit their Facebook page, find the Christmas photo contest album and Like the entries of your choice. Each entry will indicate what shelter they are supporting. Please support us by taking a few minutes to flip thru the photos and like the ones for Halfway Home. Every “Like” is a donation! Our newsletter will be late because we just have not had time to do one! August 22, 2014: As of August 23, we will be closed to new intakes from the general public until October 1, 2014 or until our cat population is reduced by adoption. We are simply full with kittens and young adult cats and adoptions have been slow. If you have a need to surrender your cat or have a stray cat problem, please contact your police or locally-contracted shelter. If you are wanting to adopt a kitten (or two) or a nice young adult cat, please download your application from this site or call 999-1075 to make an appointment to see our available kittens and cats and pick up an application. If you have a few hours a week that you can commit to helping our little rescue, please call 999-1075 for a volunteer application. We also participate in the local high school community service requirement. Cook Florist in Presque Isle would like your used vases and baskets recycled with them. They will donate proceeds to Halfway Home during August. So, see what you’ve got kicking around and take them on over to Cook Florist, 174 Main in Presque Isle. Halfway home pet rescue is in great need of several volunteer medical transportation drivers. This position would include making a trip to PI about 8 am on the day of a cat’s surgery (Generally, either on a Monday or a Friday am) and then calling the vet about 3:30 to make sure the cat is ready to return to the shelter and then go to pick up the cat and return it to the shelter before the vet closes at 5 pm. Unfortunately, our expenses have been high this past year so we are no longer able to provide a $10.00 gas card to volunteers to help the volunteer with the gas expense. This task would involve the volunteer absorbing the gas expense. HHPR would alternate the driver schedule between several different volunteers so the requested trip would probably be one time per month. HHPR is currently accepting applications from high school students for volunteer work in the Second Chance thrift store this summer to satisfy their high school community service hours. Applications can be picked up at the store on Saturdays. Second Chance hours are on Saturday, Sunday and Monday from 10 am to 4 pm. Starting on May 22, the store will also be open from 1 to 4 pm on Thursday and Friday as well. Two new volunteers are needed to cover Friday afternoons. Call 999-1075 or pick up a volunteer application at the store. It’s been a busy winter and before the 2014 kitten season gets into full bloom, some of our volunteers are taking well-deserved vacations. We will not be doing any intakes this month unless the circumstances are extraordinary. If you have an urgent need to surrender a cat, please contact your local contracted shelter or police department. All of the adoptable cats that were with us have been transferred to the Animal Refuge League of Greater Portland so that they will quickly find their forever homes. We have just a few cats that still need time to rehabilitate and we still have 3 beautiful rabbits that need homes. Our Second Chance store at 31 Herschel Street in Caribou will be open weekends, 10am to 4pm. The pet rescue has specialized in recycling projects for several years in order to subsidize the rescued cats’ medical care. To date the programs have been returnable bottles and cans for redemption, nicely used shoes redemption and used name brand ink cartridges. “The store is a continuation of the recycling image that HHPR projects as a way to save our cats and at the same time help to save our environment.” said Milton. 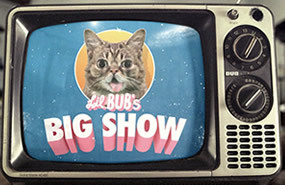 “We save the cats, save on the landfill problems, offer low-cost nicely used items for low-income and/or thrifty families. It’s a win-win situation for making the most of what is already available—cut out the waste.” Milton added. The store is situated at 31 Herschel St., Caribou in the building owned by Gary St. Peter. Second Chance hours will be on Saturday and Sunday from 10 am to 4 pm. As volunteers sign up for store sales people, the store will then be open on Thursday and Friday afternoons. If you have an interest in becoming a store volunteer, please call Mary Rowe at 999-1075 to receive an application. It’s been a month of miracles and sadness. We’ve had so many sick cats come in for help and we’ve helped many but we also lost our sweet girl, Kristy. She had been brought in by the Fort Fairfield PD who found her soaking wet in a snowbank, nearly frozen to death. It is believed that someone abused her and finally tried to drown her. We gave her everything we could medically but most of all love. She was unable to survive her injuries but she spent the final few weeks knowing people really cared. On the miracle side – our vet bills grew so large that we were concerned about being able to pay them. But our supporters rallied once again! Many generous people donated money to our cause, donations of all sizes. And we once again began to see promise. But then… as it often happens… that one angel steps into the picture and does something wonderful. Pat Canavan presented Norma with a $2,500 check!!! Pat had been feeding some ferals and asked for our help, which of course we couldn’t resist helping ferals! And to show her thanks and to help us continue our mission, she wanted to help us in this way. We’re so grateful to Pat for helping save these wonderful cats. And we’re grateful to the other feral feeders this winter who have worked with us. We continue to focus on the cats who fall through the system cracks – the abandoned and feral. We’ve also provided aid to low-income families in various ways. We’ve been working on managing two feral colonies in the area and that’s going well. The population of cats at the shelter has been kept to a minimum during these projects. Ferals are only kept long enough for their medical clearance and then relocated in groups to the same feeder barn. We’ve sent more cats to the ARLGP and they are finding good homes. We’ve heard through the grapevine that Bangor may already be getting into kitten season and we’re hoping that we do not have an early one this year. Kittens require so much care, especially if they do not have a mama. If you’d like to be involved as a foster mom to kittens, please contact us so we can make sure you have the experience, environment and training to join our team. Speaking of our team, Angela Flanagin has joined HHPR as our Health Director. Her experience as a vet tech is priceless. We’re very fortunate. Honor Your Beloved Pet: We encourage you to send us a donation in honor or in memory of your beloved pet. If you send us a photo, we’ll post on our Adoption Center wall. HHPR has been focusing its work on the more critical cases of abandonment, hoarding, and feral colonies. This winter has been so terribly cold that we are seeing frostbite injuries that need medical attention. Unfortunately, owner surrender cats are a low priority right now but they will be considered on a case by case basis. We ask for a $40 surrender fee to help cover the costs of the intake medical procedures (parasite treatment, FIV/Leuk testing). We have established a great working relationship with the Animal Refuge League of Greater Portland this winter during our overpopulation crisis. The ARLGP has taken many of our cats and found good homes for them. We continue this relationship to keep our numbers down. This is especially important when the 2014 kitten season will be upon us before we know it. We continue to be open for adoptions and welcome adoption applications and inquiries. Call 999-1075 or email admin@halfwayhomepetrescue.org. For news of previous years, visit our News Archive. Unless advertised otherwise, we hold Adoption Fairs at our Adoption Facility every Saturday, Noon to 3pm OR by appointment. For the latest in last minute changes, visit our Facebook page. The south end of 489 Main Street. 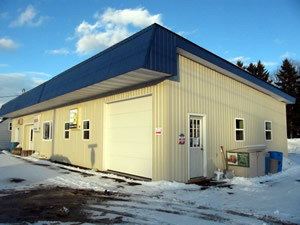 HHPR Adoption Facility is located at 489 Main Street, Caribou, Maine. This is in the Belanger Diesel building on the right side (south). Beaulieu’s garage is right across the street. Please do not try to enter the Belanger Diesel office at the left side of the building. We DO NOT accept cat drop-offs at this location. If you need assistance with a cat, please call 999-1075 and clearly state your need and provide a phone number.